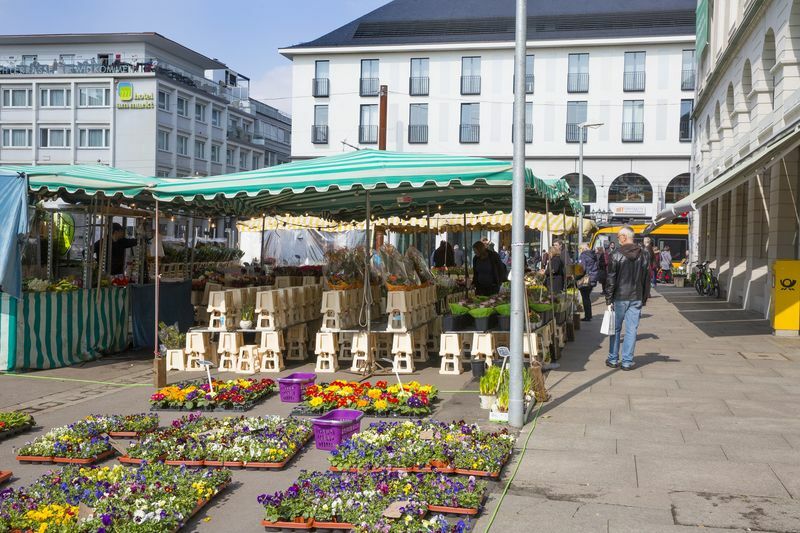 The market square (Marktplatz) is in all probability the best-known square in Karlsruhe. 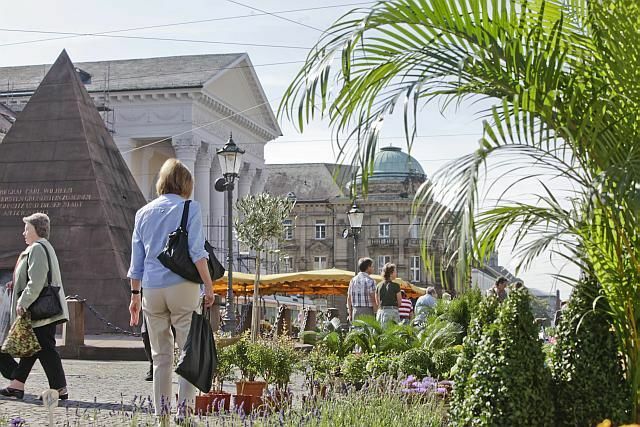 Situated on it is the city's hallmark, the pyramid, built in 1823 as well as the municipal protestant church, the town hall, and the market fountain. 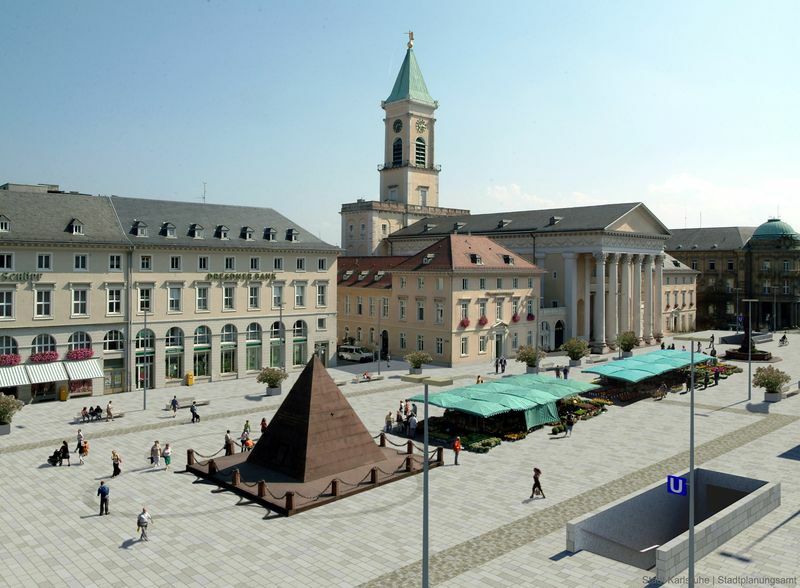 The plan for the market square along with the municipal protestant church and town hall was drawn up by Karlsruhe's famous master builder Friedrich Weinbrenner then approved by Margrave Karl Friedrich in 1801. It was Weinbrenner, too, who planned the main buildings outling the square such as the municipal protestant church and town hall. This gave rise to an ensemble regarded worldwide as a prime example of neo-classical building and one that has retained this character today. Characterising the market square as its most conspicuous building is the pyramid. It is a monument to the city's founder Margrave Karl-Wilhelm and protects his grave. It was initially made of wood but was then reconstructed in stone in 1823 exactly where the tomb of the original "Konkordienkirche" (demolished in 1807) had been. The crypt from the 18th century still survives. The city fathers made the decision to build a new town hall at the southern end of the square and opposite the municipal protestant church in 1804. Work on the northern side-wing began in 1805 according to plans by Friedrich Weinbrenner. The plans for the main building had to be altered several times, however. One of the contentious issues was the high watchtower, which, as the counterpart to the tower of the municipal protestant church, Weinbrenner did not want to abandon. Today, a figure of Mercury stands atop the tower as a symbol for trade and change. The foundation stone of the new town hall was not officially laid until 1821. The building was completed in 1825. It was badly damaged in World War II but was reconstructed by 1955. The central face of the building features a pillared loggia and, like the wings to either side, has a slightly protruding gable end. Situated between the town hall and the municipal protestant church is the market fountain designed in 1822, an octaganol water basin with a statue of Grand Duke Ludwig standing on a high pedastal. The statue created by Aloys Raufer in 1833 was reconstructed by Fritz Moser in the early 50s.